IRELAND. County Down. Newtonwards. IOHN MCCULLY. Æ twopence. 5.77 gm. 24 mm. 1761. 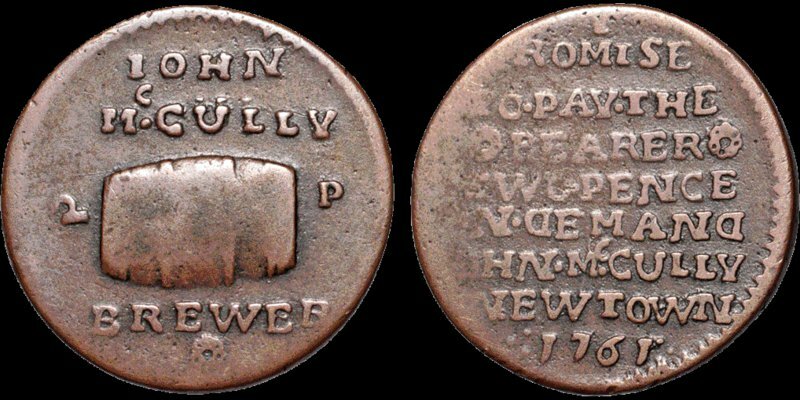 A cask: IOHN MC•CULLY in two lines above; BREWER below; 2 P on sides; a rose at the bottom / I PROMISE TO PAY THE ❁BEARER❁ TWO PENCE ON DEMAND (D's reversed) IOHN MC•CULLY NEWTOWN 1761 in nine lines. Davis 44. Withers 44-46 (unpriced higher than "mediocre"). Very Fine; attractive brown tone. Rare.